In the early 1960s NASA's research work into lifting body designs was in full swing with the X-23/PRIME program testing lifting bodies in the re-entry regime from orbit. I had previously blogged about the PRIME program and the data that it provided the aerospace industry. 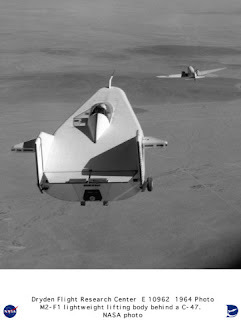 But while the unmanned X-23 program answered the question of a lifting body's flight characteristics at the high speeds encountered during re-entry, questions still remained about the suitability of a lifting body in subsonic flight- would a lifting body design be controllable and stable in the low speed flight regime upon return to Earth of a reusable space vehicle? 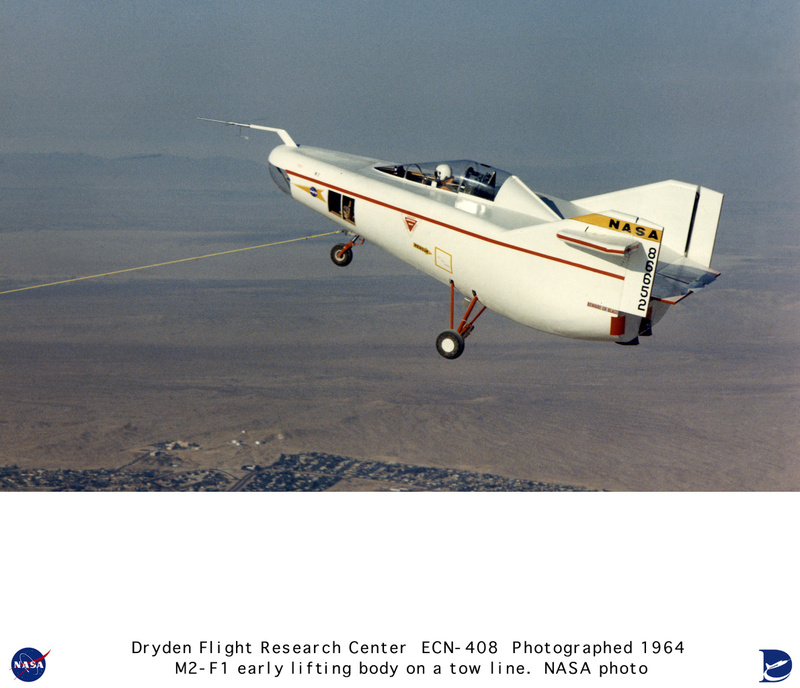 At the time, Dale Reed, an engineer at NASA's Flight Research Center (FRC) at Edwards AFB, had been following the lifting body research in his free time. Being an avid remote-control aircraft model builder, Reed built a 24-inch flying model of what was designated the M2 shape- the M1 shape was the product of research at NASA Ames which started out as a 13-degree half cone with a rounded nose. The M1 shape was refined into the M2 shape which added twin vertical fins, a canopy for a pilot, and horizontal control surfaces. This M2 shape was what Dale Reed modeled in his free time and dropped it from a 60-inch remote control "mothership" while his wife Donna would film the M2 model flight with an 8mm camera. He later showed the films to the director of the FRC, Paul Bikle, and Alfred Eggers, one of the pioneering researchers on lifting body work. They were suitably impressed with Reed's work that in November 1962 Bikle authorized a six-month program paid out of the FRC's discretionary fund to build a manned glider version of Reed's M2 model. The M2 glider had a steel tubular frame to which was attached the pilot's seat and landing gear (taken from a Cessna 150)- the exterior would be a light wooden shell this way different shapes could be tested. As it was, work on the lifting bodies within NASA would eventually settle on the M2 shape as the most ideal and the glider was designated the M2-F1. Space was set aside in the main hangar at the FRC which was cordoned off and nicknamed "Wright's Bicycle Shop". A local glider builder was contracted to help construct the outer shell while NASA engineers and technicians, many of whom were members of the Experimental Aircraft Association (EAA), lent their time and talents to the construction of the M2-F1. As many of them did it in the free time, it ended up costing NASA only $30,000 to build the M2-F1 when it was finished in early 1963! One of the reasons Paul Bikle funded the program out of FRC's discretionary fund was that he feared NASA headquarters in Washington would disapprove, or worse, take control of the project and make it excessively complex and expensive. The finished M2-F1 was 20 feet long, 10 feet high, and 14 feet wide. At the aft ends of the blunt half cone it had twin fins that mounted horizontal control surfaces nicknamed "elephant ears". The main body itself had two flaps at the end that were for trimming the glider in flight. Complete with the pilot, the M2-F1 weighed only 1,138 pounds. Later in the flight test program a Weber zero-zero ejection seat was fitted, but for the first set of flights, no ejection seat was used. 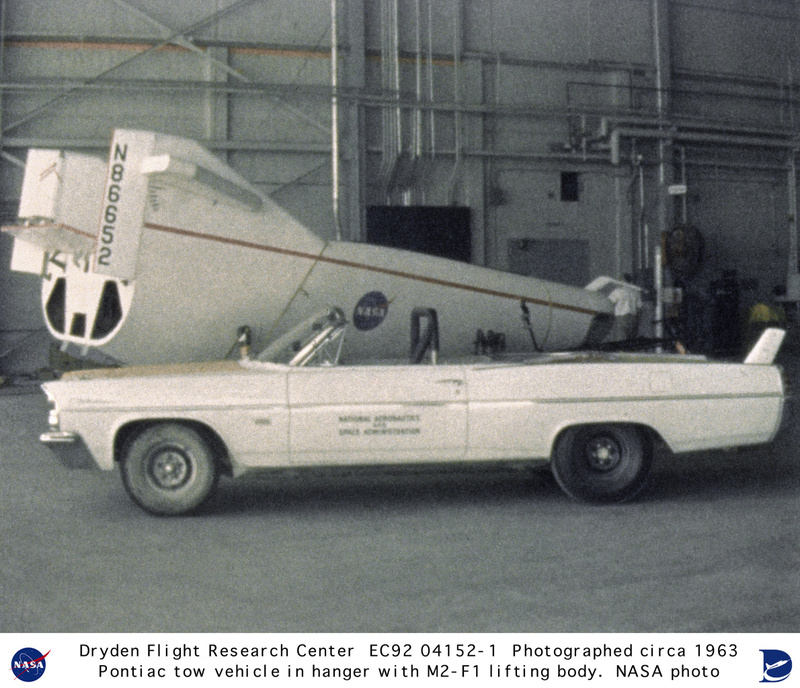 By March 1963 the full scale wind tunnel tests at NASA Ames were completed with encouraging results and back at Edwards AFB tow runs were made with various vehicles pulling the M2-F1, the first captive flight taking place 5 April 1963. For these initial flights, the M2-F1 was suspended below a Rogallo wing as the vehicles weren't fast enough to pull the M2-F1 to its rotation speed. The engineers wanted to a faster vehicle to get the M2-F1 airborne before pulling it aloft behind a tow aircraft to higher altitudes. A 1963 Pontiac Catalina convertible was procured and stripped down. It had a 455-cubic inch engine, four barrel carburetor, and was a five speed stick shift. The engineers enlisted the help of famed California hot-rodder Bill Straup in Long Beach to replace the street tires with racing tires and to tune and tweak the engine for maximum performance. Rollbars and radio equipment were installed and the right hand front passenger seat was turned around to face aft. Adorned with the suitable high visibility markings and NASA logos, the FRC's hot rod pulled the M2-F1 for the first time airborne in June 1963. Satisfied with the near-ground/low altitude peformance, a Douglas R4D (Navy version of the DC-3/C-47) pulled the M2-F1 glider aloft for the world's first piloted lifting body free flight on 16 August 1963 when NASA test pilot Milt Thompson cast off from the tow plane at 10,000 feet and landed smoothly onto Rogers Dry Lake below. Six other test pilots flew the M2-F1 glider after casting off from the R4D towplane- Bill Dana, Capt. Jerauld Gentry, Don Mallick, Bruce Peterson, Donald Sorlie, and Col. Chuck Yeager. Bruce Peterson and Milt Thompson flew the majority of the M2-F1 flights. The M2-F1 eventually got a proper ejection seat and a small rocket was added which was fired before landing to assist with the pre-landing flare. Eventually modifications and test equipment required the M2-F1 to trade in its Cessna 150 landing gear for the gear of a Cessna 180. The last M2-F1 flight took place on 16 August 1966 after just over 100 flights and 400 ground tows. It was donated to the Smithsonian Institution and was restored years later and returned to NASA Dryden (what the FRC is today known as) for display. Proving that a lifting body shape could be safely flown at subsonic speeds, NASA proceeded to develop the M2-F2, a heavier, alumimum, rocket powered version that was dropped from the NB-52A and was capable of supersonic flight. Plans were to build two M2-F2s, but eventually one M2-F2 was built to supersede the M2-F1 and a competing lifting body design was built by Northrop as the HL-10. As an interesting bit of television trivia, the crash depicted in the opening of the "Six Million Dollar Man" is Bruce Peterson crashing in the M2-F2 on 10 May 1967, which he did survive. Source: Space Shuttle: The History of the National Space Transportation System- The First 100 Missions by Dennis R. Jenkins. Specialty Press, 2008, p36-38. Great article. In the interest of accuracy the 1963 Pontiac Catalina was available with a 455hp 421cid engine and a 4 speed manual gearbox. TAILS THROUGH TIME now has its own URL at www.tailsthroughtime.com! The previous URL of aviationtrivia.blogspot.com still works and will redirect you to the new URL. You may see those redirects within article links that connect to past articles. Those airLINKS below marked with asterisk require registration, but are free.